Risk all to reject one expression and gain another. Very few musical acts can remain consistently popular over the decades without a reinvention or two along the way. U2 figured this out at the end of the 1980s, as they threatened to turn into self-parody if they continued on the path followed with 1987’s Joshua Tree and 1988’s Rattle and Hum. U2 retreated to the barely-reunified Berlin to rethink what they wanted to be and produced 1991’s Achtung Baby, often viewed as one of the more radical self-recreations to come from a major band. Fans argue whether Achtung or Joshua Tree deserves to be viewed as the group’s pinnacle, but it’s a tight race; both have ardent admirers. 20 years after Achtung left such a dent on the music world, U2 re-examine its creation and legacy via a documentary called From the Sky Down. As expected, it mixes archival materials and fresh information. 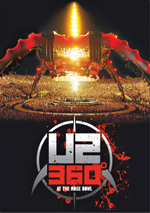 The film provides comments from all four band members – Bono, the Edge, Larry Mullen, Jr. and Adam Clayton – as well as producers Brian Eno and Daniel Lanois, photographer Anton Corbijn, manager Paul McGuinness, engineer/co-producer Flood, and show designer/director Willie Williams. Sky uses rehearsals for the band’s 2011 appearance at the Glastonbury music festival as the framework to launch its look back at Achtung. We also see modern footage in which the band returns to Berlin to go back to the studio at which they recorded Achtung. After those intros to set up the story, we head back in time to get a quick history of U2. This focuses more on the late 80s as it leads into how U2 sent themselves to Berlin in 1990 to record Achtung, and we learn about its creation as well as aspects of the 1992-93 concert tour. As a longtime fan, I already knew a fair amount of what Sky told me, but I still looked forward to its “you are there” perspective and hoped to get some new nuggets from it. At its start, I worried that it’d be little more than meandering navel-gazing. The use of the Glastonbury festival as some landmark doesn’t make sense to me – a band as big as U2 has played more significant shows – and a lot of the modern-day footage seems superfluous. For a while, I worried that we’d get nothing more than vague mutterings about the band and little real info about the subject at hand. Once Sky more formally heads back into the band’s origins and development, though, it picks up considerably. If you don’t already know much about their history, don’t expect to get much from Sky, as it creates a real thumbnail sketch. Its look back focuses more on the band members and their personalities than the usual “in 1980, U2 released their first album” stuff; I wouldn’t call it impressionistic, but it borders on that. The pace becomes more involving – and revealing – when we get to 1987 and the band’s commercial breakthrough with Joshua Tree and its subsequent tour. One really needs to understand those events and U2’s minor fall from grace in 1988-89 to comprehend what led to Achtung, so it makes a lot of sense that we get so much about that era. 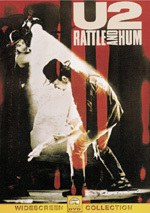 This may well’ve been the most revealing part of the film, as it unloads some good insights into what life was like for the band when they hit the top of the top as well as how they dealt with the criticism that rained on them following the seemingly narcissistic Rattle and Hum. Sky doesn’t get to the 1990s until close to its halfway point, and that’s fine. Actually, it probably is a little late due to those early modern-day meandering bits, but I wouldn’t lose any of the historical material it explores. By the time we get to Berlin, we feel we understand the context that led the band there. The film also delves into the album’s recording sessions pretty well. This never becomes something akin to the “Classic Albums” DVDs; though it does offer some demos and song breakdowns – mainly for “Mysterious Ways” and “One” – it’s not in the same wonderful trainspotting league as the “Classic Albums” franchise. Still, it does enough to satisfy fans, so we get a decent accounting of the Achtung sessions. I’d like more about Zoo TV, though, and probably could use more details about the songs. That’s the “Classic Albums” fan in me, I suppose; maybe someday we’ll get an extended cut of Sky with added material of that sort. Until/unless that happens, Sky will stand as a good examination of a major band’s critical juncture. Without the reinvention of Achtung, would U2 remain as popular as they are today? Probably not - More Joshua Tree likely would’ve sold well in 1991, but without creative growth, the band would’ve faded. Sky gives us a nice view of how this seminal album came to be. 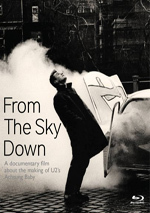 U2: From the Sky Down appears in an aspect ratio of approximately 1.78:1 on this Blu-Ray Disc. Because it came from a hodge-podge of sources, I didn’t expect Sky to look very good, but the quality of the presentation seemed surprisingly positive. That fact mostly came from the modern elements, which offered excellent visuals. At all times, these clips were crisp and detailed, as I didn’t notice any hints of softness. Jagged edges and moiré effects seemed absent, and I witnessed no signs of edge enhancement or source defects. Due to the settings in which they were shot, the colors remained subdued, but they appeared appropriately rich and vibrant. Black levels were quite dense and tight as well. If I rated the disc based solely on the interview clips, it would have earned an “A” or an “A-“. Unfortunately, I needed to factor in the archival material as well, and that’s where Sky necessarily lost points. A mix of sources constituted all that stuff. Some of it seemed reasonably accurate and clean, but lots of it appeared pretty ugly. Source flaws weren’t that much of an issue since most came from videotapes, but otherwise many of the snippets seemed muddy or drab. I still felt impressed enough with the visuals of Sky to give its picture a “B+”, though. While not dazzling, the DTS-HD MA 5.1 soundtrack of Sky was fine given the film’s scope. As one might expect, music dominated the track. Various songs spread across the front speakers in a satisfying way, and the surround channels added good reinforcement. Non-musical elements had less to do. Speech remained focused in the front center – with only an occasional spread to the side - while effects only sporadically appeared at all, much less around the soundfield. And that was perfectly appropriate for this movie; it’s about music, so that side of things should dominate. Audio quality was positive. Music varied due to the mix of source elements; some sounded fine, while others were pretty awful. Getting past flawed archival material, the music came across well. A few extras round out the disc. First we get three bonus songs recorded in May 2011. These include “So Cruel”, “Love Is Blindness” and “The Fly”, all shot during the band’s anniversary trip to Hansa Studios, the site where they made Achtung. Bono does “So Cruel” and “Fly” solo, and Edge sings “Blindness” on his own. These versions aren’t killer, but they’re interesting reworkings of the tunes. Recorded at the September 2011 Toronto Film Festival, an Online Press Conference runs 44 minutes, 45 seconds and features Bono, the Edge, and director Davis Guggenheim. They discuss reactions to the final film, reflections on the band, Achtung and their career, and creating Sky. Bono and Edge do the vast majority of the talking, so don’t expect much from Guggenheim. Still, it’s a peppy chat and an enjoyable look at U2. Finally, we get a Photo Gallery. It contributes 17 stills, most of which come from either modern studio recording sessions or the band’s 2011 trek to Berlin. A couple of circa 1991 pictures emerge, but not many. It’s an ordinary collection that doesn’t add much. 20 years after its release, Achtung Baby remains an impressive, forward-looking piece of work, and From the Sky Down delivers a fairly satisfying look at its creation. While it’s not as “nuts and bolts” as I’d like, it’s still involving and informative. The Blu-ray provides good picture and audio along with a few decent supplements. 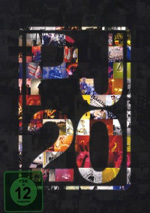 U2 fans will definitely want to add this to their collections.